“My role in Engineering is that of Data Scientist“. Michele Gabusi, age 32, with a degree in physics and a doctorate in his pocket, admits that he finds it difficult to describe his work precisely. “It is a fairly new profession in this kind of business” –Michele says – “Basically it consists in exploring and processing data to solve problems and deliver new solutions. It is a team effort, where everyone must dig through data using different methods and based on his/her skills, but with a common purpose: to extract value from them and to produce an advantage for the customer”. “Some think that we need to be engineers to be able to do this work, but we realized that the ideal team should consist of different skills, ranging through those of computer scientists and engineers, physicists, mathematicians and statisticians, graduates in neurosciences, but also computational linguists graduated in neurosciences. It is essential to have some expertise in the Machine Learning or modeling area or some statistical knowledge. Knowledge of at least one programming language is also important; we use a great deal of python for example. More generally, however, I think the desire to read, read, read about anything is essential; curiosity towards problems, not being content with superficial explanations, keeping up-to-date and the ability to communicate with others to present results and being willing to discuss these. The first two characteristics I think are typical of young people, who have just finished their studies, while the analytical skills and the more technical ones are often found in STEM graduates”. Which study program would you recommend to anyone wishing to take up this work? “I do not think there is one in particular, but as a physicist I can say that I feel very comfortable in this role, perhaps because of the predisposition to look for solutions through the Galilean method too , and because of a familiarity with some mathematical and statistical methods. A strong mathematical mentality and a feeling for numbers and orders of magnitude certainly help, but they are something that can also be acquired through different professional paths”. 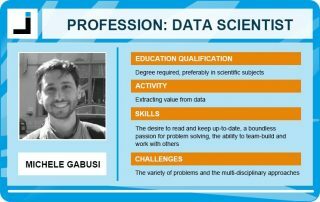 What is the typical working day of a Data Scientist like? “The good thing about this job is that working days are never monotonous and never resemble one another. Of course, there are “fixed” moments, such as the early morning meeting with my colleagues, which is when we coordinate our work, followed by frequent exchanges via chat or telephone. We then work on projects, analyzing data, constructing graphs, writing codes, delivering applications, and discussing with customers. But it is precisely because analysis requires constant updating and mental freshness, in order to deal with it, that interruptions to one’s routine are also necessary, often made up of in-depth analysis, reading, study and the reanalysis of problems. In the evening, before leaving, we try to realign ourselves within the work group on what has been done”. How important is continuous training? “As in every job, training is indispensable. This can be carried out in many ways: for sure, reading on your own, analyzing theoretical aspects through articles of scientific literature, training on more operational aspects through courses or tutorials, continuous debates with other colleagues and working in groups. To be honest, sometimes even moments of classroom training have proved to be very useful”. What is the beauty of this profession? “The best thing is the variety of problems and the multi-disciplinary approach, consisting of analysis, sometimes of numbers and tables, sometimes of texts and images and, obviously, of software development, with technologies and methods which are often new or less known. Having to deal with repetitive tasks obviously occurs, but the contexts often change. Certainly, a good dose of creativity is always required to best deal with projects”. The worst thing about the Data Scientist’s job? “I think that the worst aspect is that kind of frustration which every Data Scientist feels when he/she cannot further refine his/her work and also not being able to consider something as “finished” because it is constantly evolving. Which is of course also one of the incentives which drives us to work more and with greater enthusiasm: the beauty of this profession”. “As regards fiction I would say The Magic Mountain by Thomas Mann. I read it many years ago and I do not know if I would like it in the same way today, but I found it really great at the time. Then, professional habit, Relatività, quante storie (Relativity, so many stories), by Antonio Sparzani, the book that made me fall in love with physics, science and also the study of data”.